New England Patriots quarterback Tom Brady, (12) is congratulated by Brian Hoyer, left, after his touchdown pass to Josh Gordon during the second half of an NFL football game against the Minnesota Vikings, Sunday, Dec. 2, 2018, in Foxborough, Mass. 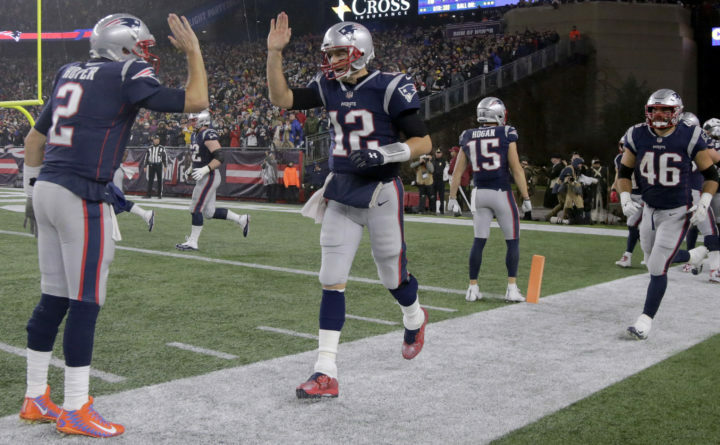 It was Brady's 579th career touchdown pass, which tied him for the most passing touchdowns in NFL history. Dorsett, a wide receiver, is like almost every other Patriot. As Brady was winning Super Bowls and becoming an international celebrity, Dorsett was growing up. He was 9 when Brady won his first Super Bowl. The players who will line up next to Brady in an AFC divisional round playoff game Sunday against the Los Angeles Chargers watched his highlights throughout — and even before — adolescence. For their whole lives, football players are never more than four years apart from their teammates. Patriots rookies this season suddenly had a quarterback 19 years older than they are. Brady turned 41 in August, which makes him the oldest non-kicker in the NFL. He belongs to a protected class under the Age Discrimination Act. He’s a decade older than all but six Patriots. About 30 of his teammates this season are closer in age to Brady’s 11-year-old son, Jack, than to Brady. It places him in an unusual position. As Patriots offensive coordinator Josh McDaniels said, “One of the big roles that a quarterback plays on the team is just being able to communicate openly with each one of his teammates.” For Brady, age presents a hurdle to that role. As he grew older, the age gap between him and his teammates inevitably grew, until his teammates were from an entirely different generation. Brady’s primary strategy in navigating the age gap at his workplace is to ignore it. It’s possible for Brady to push aside the age difference because of the nature of his workplace. Brady has fit into the Patriots’ locker room for his whole career, and little by little, he became surrounded by millennials. A football locker room, though, is a place of suspended youth. But Brady takes connecting to his teammates seriously. It starts with the greeting Dorsett had in the training room. Every time a new player signs, regardless of stature, Brady makes it a point to say hello. A quarterback who requires no introduction has anyway grown expert at it. “He’s one of the first guys in the building to know a new person’s name,” McDaniels said. “That was kind of a dream,” Patterson said. Younger teammates say they can converse with Brady about the music and pop culture they consume. In training camp, teammates spotted Brady attempting the Kodak Bop, a dance move running back James White had performed after a touchdown. The value in those connections cannot be measured, but it is unquestionably part of the Patriots’ success. Brady possesses more insight into football than perhaps any active player. It would mean little if he could not relate to teammates well enough to pass it on. That connection may matter more to Brady’s youngest teammates than at any point in his career. Megan Gerhardt, a Miami University business professor who specializes in leadership and generational differences in the workplace, said this generation thrives on interaction and relatability. Vince Carter is one of the few active professional athletes in Brady’s position, an island of middle age in a sea of youth. Carter will turn 42 this month, which makes him 11 years older than his oldest Atlanta Hawk teammate, Jeremy Lin, and a few months younger than his coach, Lloyd Pierce. Rookies Trae Young and Kevin Huerter were not yet born when Carter was drafted. In one game this season, Carter told 24-year-told teammate DeAndre’ Bembry what he planned to do after catching a post pass. “Oh, I know,” Bembry told Carter. Bembry explained that he had studied Carter on YouTube as a kid. When asked how this generation differed from those before, Carter laughed. “It’s so many things,” Carter said. “It’s tough to pick one.” He settled on an increased sensitivity, which Carter attributed to social media. He has been conscious to bridge the generational chasm. The Hawks have team dinners where cellphones are disallowed to foster conversation. Carter tells stories from his first seasons in the league. Carter and Brady share a knack for relating to far younger, far less famous teammates. Teammates say Brady is eager to hear their perspectives, which is crucial to bridging the age gap. Bonnie Hagemann is the author of “Decades of Difference,” a book about age gaps in the workplace. She said her first advice to Brady would be to not come across to his younger teammates as having every answer. This might be hard for Brady, because chances are he does. But that stance makes teammates more receptive to his advice. “If you show your openness to learn with them, then it’s very likely they’ll show their openness to learn from you,” Hagemann said. Age in the workplace, Hagemann said, should be viewed as a form of diversity. Different ages can mean different perspectives. The best companies or organizations thrive on them. Gerhart, the Miami professor, developed the idea of “Gentelligence,” which stresses the importance of generational differences in a workplace. Andrew Knight, a Washington University business professor and researcher, said sports teams are attractive to academics who want to study age diversity in the workplace because so much data is so easily available. But a cross-section of those studies, he said, turns up only weak links. They do not reveal whether any kind of diversity — age, ethnicity, gender — is important. Instead, Knight said, the best indicator is how an organization is set up to handle potential differences, or to turn them into a collaborative strength. “To help explain when it’s good and when it’s bad, what the structure or the system is — or what a leader is like — help to explain when diversity can be beneficial and when diversity might be a detriment,” Knight said. Take one look at the Patriots’ leader. Coach Bill Belichick famously demands and creates a culture of discipline. He has created a structure, Knight observed, that would obliterate the potential for an age difference to hinder the locker room. For him, Brady’s age is just another factor unrelated to an urgent task, so it is a factor to be brushed aside. That extreme camaraderie may be the most crucial difference between a football locker room and a typical workplace. Players spend hours together, reliant on one another for their livelihood, working under the same physical strain and fears of coaches screaming at the them. Brady has done his best to understand his teammates, even if they are now of a different generation. As he has helped them understand the game, they have helped him, too.